Great rug! Fits perfectly in our almost finished pantry. It’s light and a great weave. It looks really nice and was a great price. Highly recommend this. Indulge in the breezy casual vibes of the Montauk Collection from Safavieh. Capturing the essence of casual designer styling, these flatweave rugs are hand-woven from pure premium cotton. Place these rugs in any room of the home to complement any décor from coastal to contemporary. Dimensions 2 ft. 6 in. x 4 ft. I Have many of these rugs in all different sizes. I have washed all of them many times. Cold water, delicate and just dry on low for a few minutes. Hang to dry the rest of the way. I then iron them with a steam iron. They come out like new!! I like the way this rug looks- or at least I used to. The fabric of this rug attracts EVERYTHING. I have a dog (which doesn't even shed too much) and despite constant efforts to vacuum this rug its basically just a catchall for every speck of dust or fiber. Lovely rug. Wishing it was washable as I am using them in the kitchen, but easy to shake out and get the desired look! Also, I would advise getting a slip guard for underneath the rug. It curls a minimal amount on the edges, but I think this would be resolved from a rug pad. Would recommend! Love the color and feel of the rug. I'm super happy and planning to order the big size as well. Loved this rug, looks great. I am overjoyed with this purchase! In fact, I like it so well that I have since ordered a second one exactly like this (for when #1 wears out) and a matching 8' round one. These look great, wash well, and are on trend. If I had to say anything negative about it, it's that the black shows hair from my white cat and the white shows hair from my siamese... but if you can keep pets off it (or don't mind vacuuming often), you will really enjoy having this rug in your home! Gorgeous rug! It looks perfect paired with a normal jute type smaller rug for a layered looked. Really brings my smaller porch together and makes it look more modern. Everything shows on this rug - garbage, dirt, small bits of whatever that might be on your floor and stuck to your feet when you walk. Also the "white" in this rug is more of a cream color. 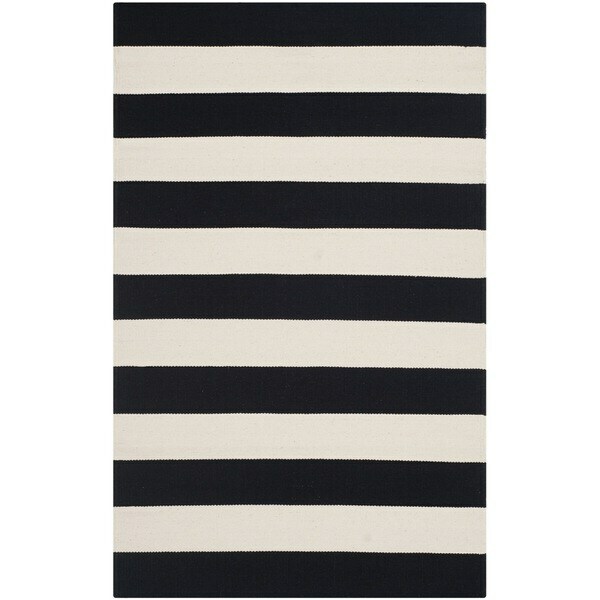 Thin versatile rug. I have it in my laundry room and it is much better than standing on the cold tile. I would suggest rug tape or pad to help with it sliding around. Love this look my kitchen. Good quality and stylish. Easy to clean. Machine wash. Would definitely recommend. This rug was a perfect compliment to my covered porch layout; it contrasted well with my coir welcome mat. Didn't bleed when wet, and maintained it's shape! I was skeptical at first, but this rug came in and I was so pleased. Lays flat and stays put with a little rug tape. We have wood floors and it makes our old house have a nice modern edge! Beautiful rugs. I bought three of these for my new kitchen. I love that they are so soft and reasonably priced. They wash up nicely. Air dry. Love this rug. 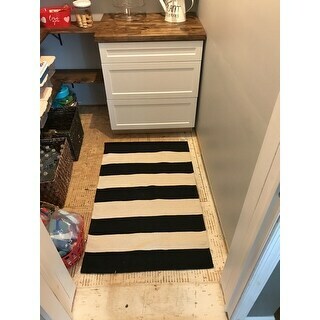 It is the perfect size to layer with another door mat. It ties the porch together throughout the holidays. Very pleased with my purchase. "Is this rug truly Black & white? I have purchased several rugs (One from O.com) that ‘claim’ to be white but once delivered it is obviously not! Is it white Off-White? Cream? Beige? " My screen looks off white.